What is unfortunate about our collective love affair with the Valentine's Day sweet is that it generally overshadows all of the really incredible foods that just hit their peak when Cupid flings his arrow. Not much is in season in February around here, but further south, HOOOBOY, lots of good stuff is reaching perfection. We can thank modern technology and transportation for bringing it to our grocers just in time to chase away the mid-winter blahs. My favorite way to celebrate this long winter stretch is by feeding both my sweet tooth and my sour tooth. How? Right now is the season for citrus. The beginning of the citrus parade begins around Thanksgiving, when the clementines show up in their adorable little crates. Throughout December and January the kumquats, blood oranges, minneola oranges start to make their appearances. Then finally, in February, comes the peak of the queen of citrus, the white grapefruit. These citrus fruits are not harvested year-round, so they have not fallen into the realm of the ordinary, such as the fate for the orange and lemon. Don't get me wrong, though, even oranges, lemons, and limes are WAY better this time of year. The fruits are fatter, juicier, and sweeter than the summer renditions. Typically we think of citrus as a refreshing summertime flavor to squelch the heat. They serve, however, a different purpose in cold months. Citrus juice and zest highlight and brighten just about anything in the winter. Just a squeeze makes food seem fresher. Think about how that wedge of lemon brightens the flavor of a plate of oysters or a piece of fried fish. Imagine guacamole without that integral zing of lime. Citrus can transform average to delicious with just a squirt. The key to selecting a good piece of citrus is to rely on heft. Choose a citrus fruit that feels heavy for its size. Pick it up. You'll recognize right away if it seems weighty. That means it will be full of delicious juice. Citrus juice is easily retrieved with any variety of handheld gadgets. The segments of the fruit take a little more work, but are oh-so-worth-it! Unless the fruit is practically self-peeling, like clementines and certain oranges, the easiest way to get out the segments is to first cut off the stem and blossom end of the citrus, so that the inner fruit is exposed. This also gives the citrus a flat surface to facilitate safe cutting. Working in sections around the fruit, use a knife to saw off (top to bottom) strips of the peel and white pith, trying to not take off too much of the juicy segments. 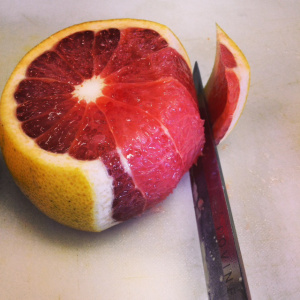 When the entire fruit is peeled, use a small knife to cut in between each of the segments to release them from the fibrous central core. Definitely do this over a bowl to catch all that good juice in addition to the segments as they fall away. If this seems too fidgety, just cut across the peeled fruit for beautiful citrus wheels, picking out seeds if they appear. Fresh orange segments will find a happy home in most salads. Grapefruit segments hold a even more special spot in my heart, as their sweet and sour flavor match wonderfully with avocados to make a show stopping winter dish that just screams fresh, amid all the slush and ice outside. 7 Right before serving, toss in the greens and dig in! Just the colors alone will brighten my mood when I eat this salad. Winter eating doesn't have to be stodgy and boring!